One of the interesting things about the trip I recently took was that my traveling companion was vegan. Since it can be a bit difficult to find places that accommodate my vegetarian diet, I knew there was going to have to be some research to make sure we could find somewhere we could both eat. Fortunately, the vegan community is great about sharing travel tips and discoveries online, so with a few key strokes I had a list of restaurants that we both couldn’t wait to try. 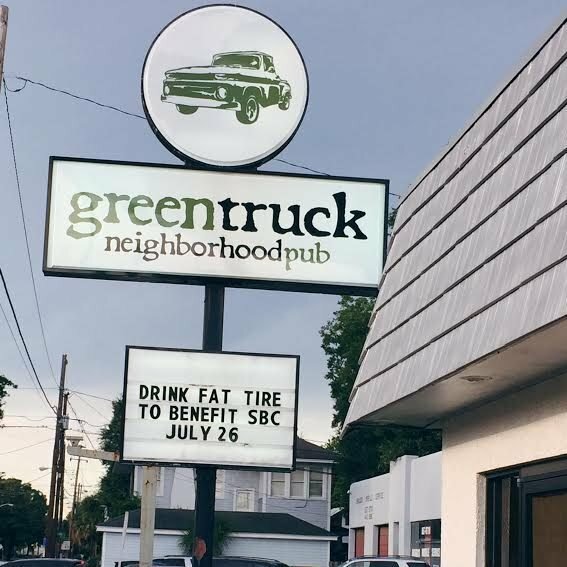 First up on our list was Green Truck Pub in Savannah, GA. After being in the car all afternoon and checking in at our Air BnB, we were both more than ready for dinner. Green Truck was a 15 minute walk from where we were staying, and we knew we’d picked the right place when we saw that they had a decent wait on a Wednesday evening. We decided to forgo the 30 minute wait and instead haunted the bar until two seats opened up (maybe 10-15 minutes). The staff was great, getting us some teas to sip while we waited and coming back by a couple of times to make sure we had everything we needed even before we got to sit down. I loved that there was a nice mix of patrons. There was everything from the elderly couple who we replaced at the bar to college students to families. Clearly, a beloved neighborhood spot. I even noticed that the wait staff and bartenders seemed to be on first name basis with some of the people coming in. The food, oh my gosh, the food! HEAVEN!!! 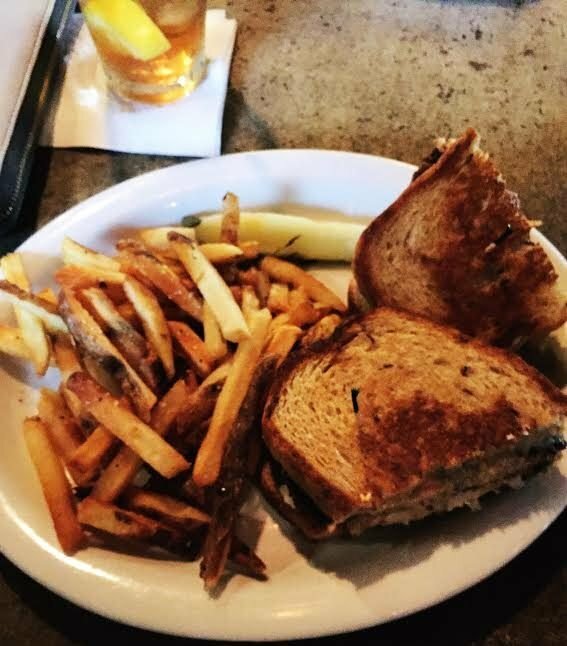 I went for their Veggie Rueben while Stefanie opted for the house made Veggie Burger. Both came with fries and the incredible spicy house made ketchup. Heck, even our pickles were house made and so good that we wedged them in on top of everything else. By the time we were done, we both completely stuffed and thinking longingly of stretchy pants. We also made the executive decision to Uber back to where we were staying instead of trying to awkwardly waddle there. I have had some incredible food in Savannah, but this place is right at the top of my “Places I’ll have to go to again.” I am hoping Andy will get to try it when we are back in November. I found something interesting while grocery shopping this weekend, Primal Strips: Meatless Vegan Jerky. What the what?! I couldn’t pass them up. I went into the taste testing process extremely skeptical, and honestly, I am kind of blown away. After purchasing our snacks, I was trying to keep my expectations low (I mean, veggie jerky; come on), but I was really excited. I ate a lot of jerky before I became a vegetarian, and I assumed it would be one of those things for which I’d never find a good replacement. We tried three of the four flavors they had at our local Whole Foods: Hickory Smoked, Thai Peanut, and Texas BBQ (I passed on the Mesquite Lime). First of all you have to remember that this is not going to taste like your standard beef jerky. Like most of the other vegetarian/vegan products I tried, it’s good on it’s own, but if you go in thinking it’s going to magically taste like meat, you’re going to be disappointed. Hickory Smoked – texture wise, this reminded me a lot of a Slim Jim. While a little toothsome, it shredded as you pulled it apart. It definitely had the smokey flavor you’d want from jerky and a bit of sweetness to balance out the flavor. Thai Peanut – probably the most “jerky” like of all three texture wise. The flavor was really subtle, and I may not have been able to identify it as “Thai Peanut” if it hadn’t been stated on the packaging. Texas BBQ – very similar texture to the Hickory Smoked (probably because they are both made of soy). Nice rich Bar-B-Q flavor, definitely the sweetest of the bunch, although not enough to be off-putting. Overall – All of the flavors ended up being a little “wet”, I’m not used to having to wipe sauce off my fingers when I eat jerky. While not exactly like meat, the bases were pretty close texture/flavor-wise to chicken or turkey jerky. I would absolutely buy these again. Each stick is 10 grams of protein, and it’s a perfect snack for keeping in your desk at the office or in your purse or briefcase. Andy gallantly offered to help me taste test, and he said even as a meat eater he’d definitely buy these again. Andy’s favorite flavor was the Thai Peanut; mine was a toss up between the Texas BBQ and the Thai Peanut. Still, if neither of those flavors were available the next time I went to the store, I would pick up the Hickory Smoked and not feel like I was missing out at all. I was cleaning out the photos on my phone the other day and I came across these three shots I took back in May when I visited my brother in Ashville. We spent the day driving around to several of the easier-to-get-to waterfalls in the area, and then we had a late lunch downtown before we had to get on the road again. Unfortunately the restaurant we had planned to go to was closed, but Charlie had a back up place in mind. The Early Girl Eatery, he got bonus points for thoughtfulness because it boasted quite a few vegetarian items on the menu. The food was really good and there was a ton of it. What you see above is just what I had ordered, the Vegan Bar-B-Q Bean Burger with White Cheddar Mac’n Cheese and Squash Casserole. The guys had to help me finish everything. You know, because they didn’t want me to feel bad about having to leave perfectly good food behind, they’re generous like that. Of course I probably would have liked the place even if the food had only been so-so, they had these gorgeous dark purple tulips on all of the tables. I didn’t steal one, but I wanted to. I know I promised pictures of my birthday gifts, but they’re on my camera. And to get them from my camera i’d have to find my USB cable, download the photos, resize the photos, upload the photos……you get the picture. Things at the office have progressed from “busy” to “crazy” in the last few days, and by the end of next week will be at “downright insane”. Tax time makes people a little nutty, and as the glorified receptionist people tend to see me as the obstacle between them and the accountants or their tax returns or whatever they’re currently frantic over. But enough of that. A couple of days ago Andy and I signed up to receive the monthly snack box from Vegan Cuts. The name is pretty self explanatory, for $19.95 a month you get a box chalk full of vegan treats. It’s not that I’ve decided to progress from being vegetarian to vegan, yet, but we’ve been trying to incorporate vegan meals a few times a week simply because they are generally pretty healthy. Anyway, we got our first box yesterday and I can’t wait to try everything! I have no idea how they managed to fit all of that into the box, but I am very impressed. It must be some sort of Vegan magic, word on the street is that going vegan will give you super powers. Although, being super awesome at box Tetris would be kind of a lame superpower. The weather was gorgeous this weekend. The temperature dropped to 56 degrees and we had one of the rare clear sunny days where everything smells clean and cold. While everyone else was complaining about the cold, Andy and I took the opportunity to pull out our comfy sweaters and use our fireplace. I even stole some of Andy’s socks so my feet would be extra warm in their slippers. Love my wood floors, but they aren’t the warmest things to walk on first thing in the morning. We met up with my friend Jenn to have brunch at my favorite vegetarian restaurant. The have the BEST veggie sausage gravy and biscuits. Fresh baked vegan cinnamon buns to go (maybe made it a hour after we got home, so good!). They had these cute terrariums for sales at the brunch place, I bought the front left one to hang in my kitchen window. Our azalea’s started blooming this week, it looks like the entire neighborhood is covered in pink & white blossoms. As you can see the ferns in our front yard are starting to take over. Andy doesn’t want to get rid of them because it makes our yard look like where the Ewoks lived in Star Wars.